A dominant research effort today gears towards the century-old dream of understanding the nervous system as a whole. 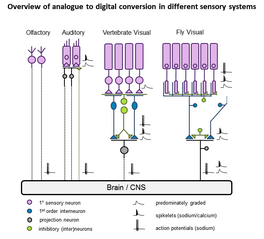 How are networks consisting of anatomically and functionally distinct neuronal elements adapted to sample, filter and forward information contained in a sensory stimulus or in central neuronal ensemble activity towards their specific computational goals? Faced with the staggering complexity of even the simplest neuronal circuits, addressing such questions continues to present a daunting task. 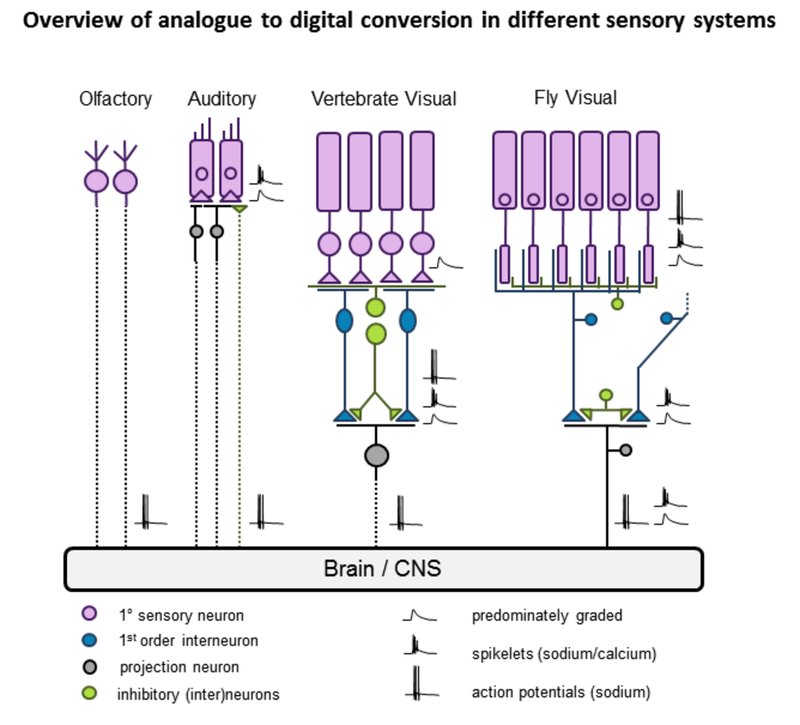 I believe that one very promising approach will lie in promoting our understanding of computations performed by specific, very well described neuronal ensembles with a clear function, input-output organization and experimental accessibility, such as the vertebrate retina. The retina is a beautiful neural circuit, and presents a powerful model system to study many general aspects of neuronal network computation, including sampling optimization, filtering as well as compression of the incoming stream of visual information into highly selective parallel streams towards transmission to the brain [1-3]. First, the retina operates almost exclusively as a feed-forward network, receiving little or no fast feedback from the brain. 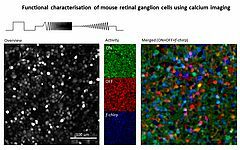 Accordingly, great control can be maintained over network input (the visual stimulus) while retinal output is readily recorded in single unit or population measurements of retinal ganglion cells (RGCs), the retina's output neurons. 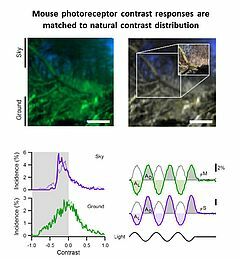 Second, the anatomical basis of the retina, particularly in mouse, is amongst the most well-described 'complete' networks in vertebrates, with ready availability of specific transgenic mouse lines and molecular markers. Third, individual retinal microcircuits tile the retinal surface, such that the same computations are effectively performed at every retinal position - this specific organizational motif greatly reduces the parameter space that needs to be explored when aiming to complement our understanding of retinal networks using computational models. Indeed, it is often possible to derive comparatively simple models of computations performed by individual microcircuits that capture the vast majority of the variance observed even when presenting complex visual stimuli [3-5]. Taken together, I believe that the vertebrate retina may be one of the very few model systems in neuroscience today that promises to hold a complete functional understanding within arm's reach. In my research I therefore focus on two general questions: What information about the visual scene is encoded by different retinal output channels (RGCs) and how are these channels built from the limited computational building blocks represented in inner retinal synaptic interactions? Left: Bipolar cell labelled with the synthetic calcium indicator Oregon Green BAPTA-1. 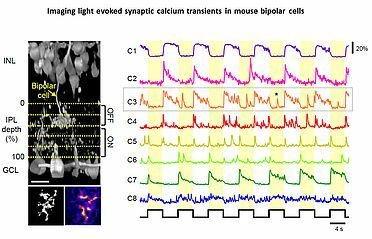 Right: responses of different mouse bipolar cells to full field visual stimulation. From Baden et al. Curr Biol 2013. Left: Somata of 600 RGC-Layer cells stained with OGB-1. Middle: Reponses to different aspects of a full field stimuli (top) and Right: merged. The different colouration of individual cells indicates different feature selectivity. From Baden, Berens et al. (under preparation). 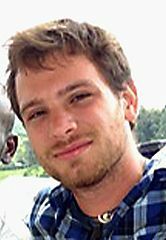 During my PhD (lab of B Hedwig, Zoology, Cambridge, UK) I studied auditory processing in crickets and bushcrickets in vivo, using a combination of single unit electrophysiological and optical imaging techniques and behaviour [6-9]. The auditory mate finding behaviour in crickets is a powerful model system allowing to unravel a specific, complex behaviour at the level of individually identified neurons, or smaller still, at the level of axonal and dendritic processing. It was during this time that I was first exposed to the idea that a complete neuronal sensory-motor circuit only a handful of neurons underlying such a complex behaviour could in principle be 'completely' understood from a computational perspective. I then switched to retina research (lab of L Lagnado, MRC-LMB, Cambridge, UK) for a two year post doc. Here I studied visual coding in single and populations of fish retinal bipolar cells using optical imaging and electrophysiology, both in vivo and in retinal slice. In addition I developed computational models of visual coding and synaptic function in the inner retina. Part of this work led to the first description of the widespread presence of active voltage spikes encoding light in bipolar cells [10-12], which traditionally had been considered purely graded neurons. Other work looked more specifically at synaptic transfer functions in the context of visual coding . In 2010 I joined the lab of T Euler (CIN/BCCN Tübingen, Germany) where I am involved in a range of projects exploring principles of population coding at different processing stages in the mouse (Photoreceptors, bipolar cells, RGCs). 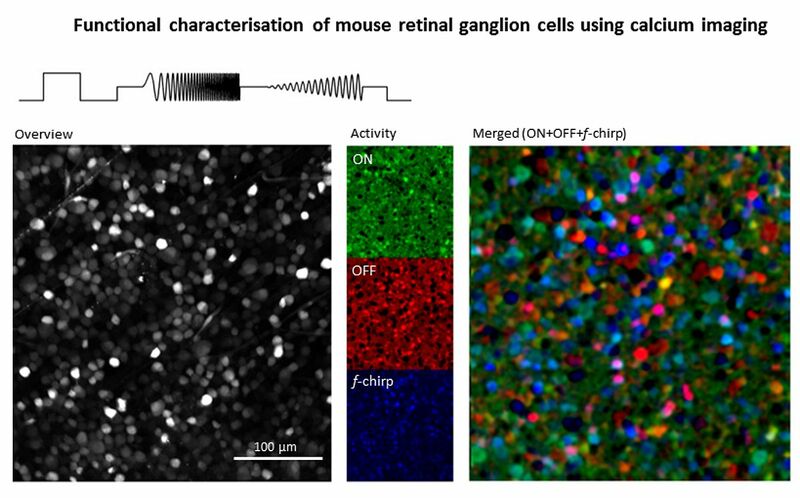 To this end we have developed techniques to optically monitor light evoked calcium changes in any neuron of the retina's vertical cone-pathway in retinal slice and/or 'wholemount' explants, based on bulk electroporation of synthetic calcium indicators  as well as transgenic animals, with perspective to also establish viral transfection strategies. 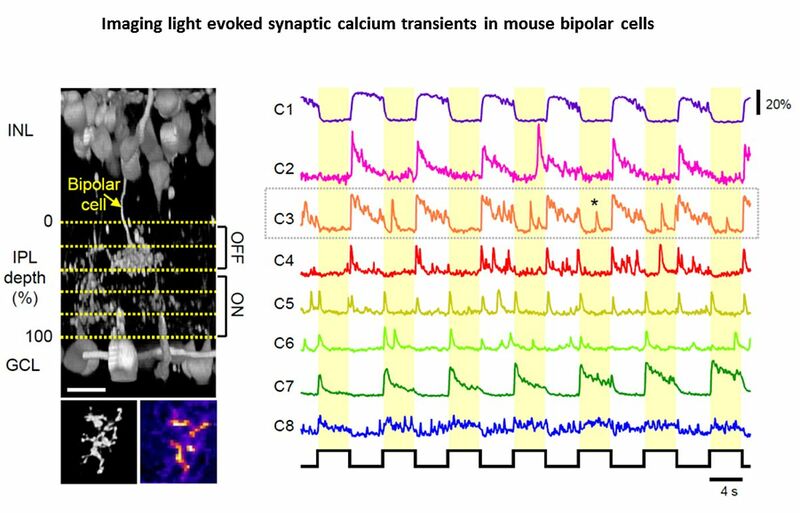 Based on our methods catalogue we have already generated the first functional fingerprint of temporal channels described by bipolar cell axonal terminals  and identified strategies for sampling optimization of natural stimuli by the mouse cone photoreceptor array . Moreover, we are working on principles of dendritic computation by RGCs (K Franke, CIN Tübingen), and together with R Smith, UPenn and RW Taylor, OHSU/Portland we continue working on synaptic processing by the axonal system of bipolar cells. 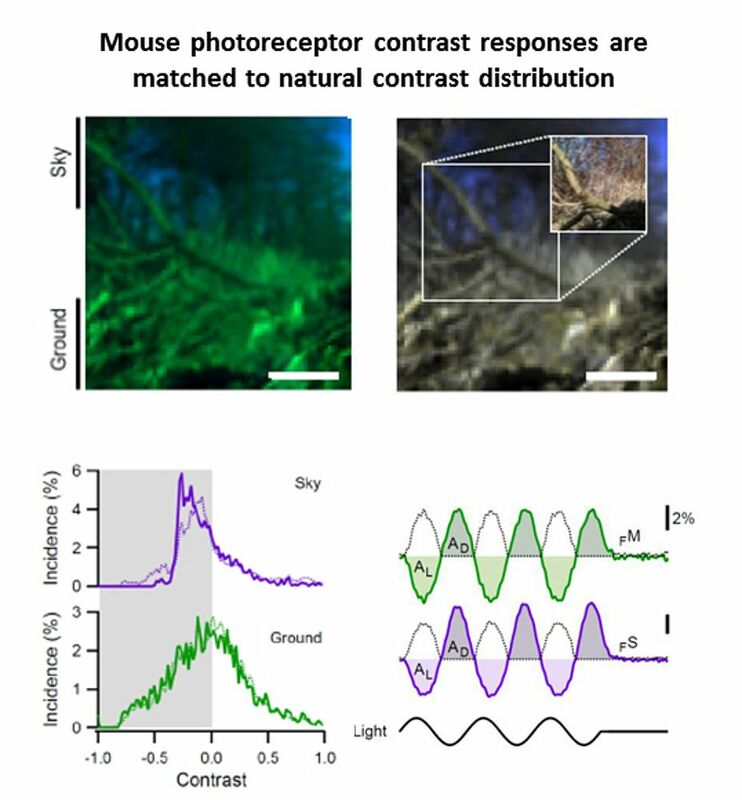 In collaboration with the P Berens and M Bethge (BCCN Tübingen) we now focus on generating the first complete functional map of all RGC channels in the mouse retina, an approach that I believe will greatly advance the field towards a complete computational understanding of key principles that govern early visual processing in vertebrates. Outside my research work I co-founded a not-for-profit organisation “TReND in Africa” together with Lucia Prieto Godino (UNIL, CH). TReND is dedicated to foster neuroscience education and research in the region, and we currently count >20 volunteer researchers on three continents, working together to bring state of the art equipment and knowledge to the African university landscape. We run a number of projects, including annual neuroscience summer schools, collection and shipping of equipment donations, outreach events at local schools or a range of online services all around the brain. We also support the establishment of the 1st MSc Neuroscience degree in East Africa at Kampala International University, Uganda. Finally, we recently launched an academic volunteering programme for young PostDocs to join African Universities for short term contracts. 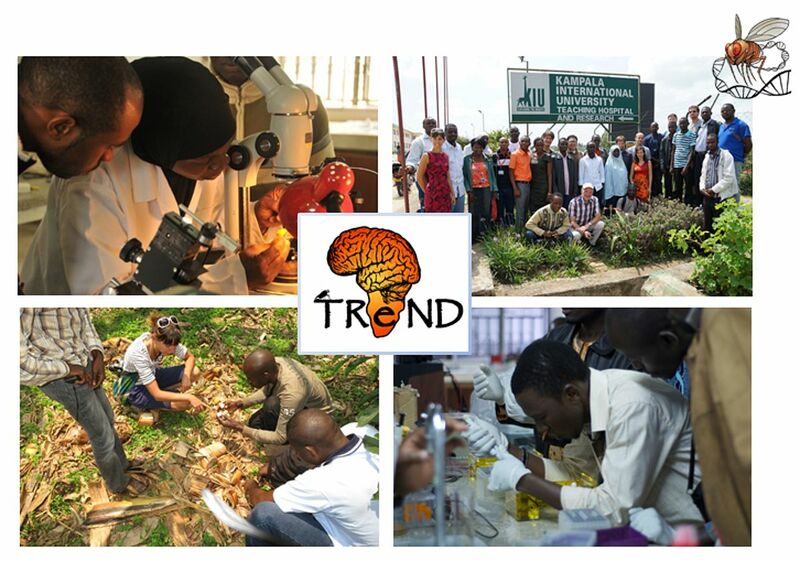 TReND in Africa – Fostering Neuroscience Education and Research on the African continent. Baden, T., et al. (2011) Spikes in Retinal Bipolar Cells Phase-Lock to Visual Stimuli with Millisecond Precision. Curr Biol. Baden, T., Nikolaev A. et al. (submitted) A synaptic mechanism for multiplexing fast and slow visual signals. Post Doctoral Reseracher, Ph. D. cantab.